Summary: In the course of ongoing work in the Key West National Wildlife Refuge, Inwater Research Group, Inc. has identified areas within the refuge where hawksbill turtles can be reliably found. 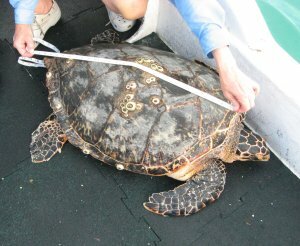 We will employ hand capture techniques to collect morphometric data and blood and tissue samples on 50 hawksbill turtles from the refuge. These data will be used to determine the size class distribution of this assemblage and, through mtDNA analysis, provide information on the natal beach origin of these turtles. This work is intended to be complementary to work funded by the Sea Turtle License Grant Program on hawksbill turtles found in foraging habitats offshore of Palm Beach County. Additionally, flipper and PIT tagging of captured hawksbills may provide information on movements between the refuge and Palm Beach County. Results: A total of 48 hawksbills samples were analyzed. The results for individual turtles are presented in Table 2A and summarized by haplotype in Table 2B. The haplotypes most commonly represented in the sample are EI-A23 (characteristic of Mexico, n=19), EI-A01 (Cuba, Puerto Rico, Barbados, Antigua, Brazil, and USVI, n=13), and EI-A11 (Puerto Rico, Cuba, USVI, Belize, Tortuguero, and Barbados, n=10). Minor contributing natal beach haplotypes included EIA41 (Mexico, n=3), EI-A09 (Barbados, n=2), EI-A42 (Mexico n=1), and EI-A43 (Mexico, Puerto Rico n=1). Four turtles had unknown haplotypes. These haplotypes are likely from known nesting rookeries where haplotype data is not currently available. Hopefully, this information with be published in the near future and will allow us to determine the source of these turtles. The natal origin of hawksbill turtles in the KWNWR appears divided relatively evenly between beaches of Mexico and Central America and beaches in the Caribbean Basin. The significant contribution from Cuba is noteworthy since it is the natal beach closest to the KWNWR.